Vintage Makeup has suggested I feature more cooking posts. I always hesitate a little since this is a beauty blog and you always hear bloggers saying "stick to your theme". Then again, it is my blog so surely I can do as I please? Anyway, it was nice of Vintage to give me feedback so this post is for her (and anyone else who's interested). When you have allergies cooking from scratch is always your best option but you don’t necessarily need free from cookbooks. I will look at any recipe, use it for guidance and substitute where necessary. I am in full time employment so generally during the week I like easy, one pot meals that take about 30 minutes to cook. One of my regular favourites is creating a dish loosely based on paella. Here’s the original recipe I use, serves 4 & is from an Ainsley Harriott Marks & Spencer cookbook. Method – Heat oil and cook onion for 3-4 minutes until soft & golden. Add red pepper, garlic and rice and stir fry for 1 minute. Add ham, stock, paprika, turmeric then bring to boil and simmer for 12 minutes. 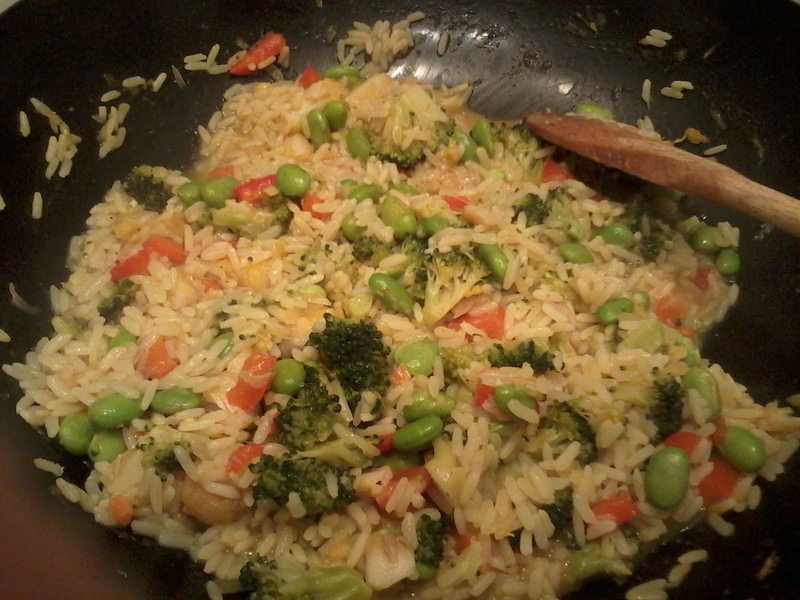 Stir in prawns and cook for further 3-4 minutes until rice & vegetables are tender. Now for my changes and suggestions, so you can create something similar to the picture below. The recipe serves 4 and I only cook for 2 so I reduce quantities. Generally I find 50-60g of rice per person is ample. You can use any rice you choose, swap Long Grain for Arborio/Risotto rice and the end result will be a creamy consistency. The amount of stock you use will depend mainly on the type of rice you are using and other ingredients in the dish. My rule of thumb is for 100-120g of rice use 1 pint of stock. The key is to add the liquid at regularly intervals. Once you have made it a few times you will get the idea how much liquid you require. The recipe says 12 minutes to cook but I always find it’s more like 20 – 30 minutes. Play around with herbs and spices sometimes I leave out the paprika & turmeric and simply add Italian herbs. I also cheat with the garlic and use garlic granules. If you are using a stock cube I find you do not need to add any salt to season. From experience, often shop bought stock cubes can be quite salty. If you are not a veggie use meats or fish that suit your palette. Comments or suggestions are welcome, let me know how you get on if you give this a try. Mmm this looks really good! I'm learning to cook, so I think I'll give the vegetarian version a go.